The Masterclass was held in Sandton, Johannesburg from 13 – 15 June 2018 and was attended by 52 delegates from 11 African countries. Disciplines ranged from tourism authorities to hotels, professional conference organisers, destination management companies and associations. The programme spanned three days, ending with a historical tour to Constitution Hill, where delegates visited the Constitution Court and the adjacent jail which was notorious for pre-apartheid atrocities to political prisoners. 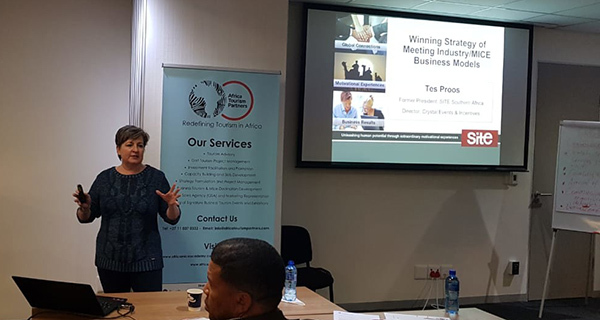 Contents was of the highest level with fascinating presentations from the likes of Dr Miller Matola (CEO Millvest); Amanda Kotze-Nhlapo (Convention Bureau Officer, SA Tourism); Esmare Steinhofel (Director, ICCA Africa); Dirk Elzinga (MD, Convention Bureau Consultants); Gillian Saunders (Deputy CEO, Grant Thornton) and Frank Murangwa (Director, Rwanda Convention Bureau) – to mention a few. Topics included destination marketing, understanding incentive travel, the economic impact of MICE travel, understanding the role of convention bureaux and government – what it takes to get the business to your destination, infrastructure requirements to deliver successful international conferences, practical approaches to ROI and ROE as well as managing risk and other legal factors. – Destinations need a Convention Bureau to successfully promote the destination for international conferences, events and incentive travel. Rwanda is a great case study on this topic, rising from no rankings at all, to featuring #3 on the African continent for 2016 and 2017! – Lack of airlift amongst African countries used to limit events across the continent. This has, however, changed in recent times and will have a very positive impact upon African events in the future. – The way Africans are doing business is changing for the better. We are seeing Pan-African travel and events growing and there exist massive opportunities to grow these markets. – Governments and private sector need to collaborate in order to unify Africa, to dispel negative perceptions and grow business travel across the continent. – Big international hotel brands developing across Africa (such as Marriott and Radisson) are having a positive impact upon external perceptions and is strengthening confidence of international travellers. The sessions were highly energised and inter-active, with a load of action points being drawn from the event. These will be published in the near future, soon as we pulled a practical action plan together. Save the date for the next Masterclass, provisionally 5 – 8 June 2019 and hope to see you there!